First, let’s talk a little bit about Bed Bugs, these little creatures are small, elusive, and considered parasitic. They live by feeding on the blood of humans and some animals, like a vampire. Spooky!! Don’t worry, there are no such thing as a vampire bug, but they do really need to seek blood to survive. The name comes from their love to live in places like beds and any other furniture where people sleep. Bed Bugs are active at night and will feed without anyone noticing. If you wake up with a small bite, you can be a victim of bed bug infestation and you should contact a pest control company in Chandler as soon as possible because they can cause skin rashes and allergic reactions. 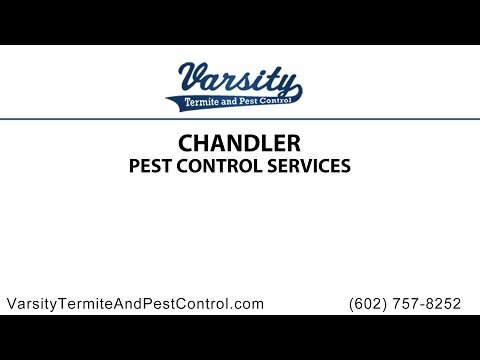 If you are located in Arizona and want to contact a company specialized these matters, Varsity Termite and Pest Control is ready to assist you in everything you need. Traveling is a lot of fun! Discovering new places with your partner, friends or family can be a wonderful experience. Even so, you have to be cautious about anything “extra” you can be carrying with you in your luggage. Bed Bugs can join you in your travels, and take over the bed in the hotel you are staying before you even notice. They don’t care about seasons; they can arrive at the least expected moment in the year so please consider being cautious about these home invaders at all times. They can be in any part of the United States, including Arizona. Since having a bed bug infestation is a really a bad experience, we will help you understand how to prevent more complications before it becomes a serious problem. Inspect everything that you have! Every time you get inside a hotel room or rented property for the first time, you need to thoroughly inspect every furniture on it. Don’t get your luggage inside until you know everything is in order. A five-star hotel can assure you that the place is completely clean of bed bugs but you can not be sure until you check it out yourself. Remember to inspect every crack and corner of all the furniture including beds, chairs, tables and closets. Also, if you find dark-colored stains or shells of skin, it might be evidence that bed bugs were there before you came. Ask for another room immediately if this happens. Don’t unpack everything when you come back: We are not saying to never unpack your stuff, we just recommend to not do it as soon as you enter your house. Take your time to unpack every element of your luggage and apply a high heat cycle before you wash them as it can help eliminate any “unwanted guest” from the place you came. Examine every detail of suitcases because these little bugs are good in hide-and-seek and they don’t like to lose. If you don’t have a place in your house to store your suitcases, you can seal them in plastic storage bags. Is there a way to save my stuff if it has been infected? Good question, little Timmy! The answer is that it is indeed possible to save your clothes and suitcases. If you are going to wash your laundry, don’t forget to separate them in colors like you would normally do. When you start to wash your clothes, set your washing machine to the hottest temperature that your fabric can handle without taking any damage in the process. If you take your clothes to a dry cleaner, mention that they are carrying something “extra”. Jokes aside, please don’t leave without specifying that there are bed bugs in the clothes you are leaving. Suitcases should be washed by hand with the hottest water you can have! (No little Timmy, we don’t mean boiling water. A temperature between 100F to 120F should be enough, boiling water is like 210F). If you are located in Arizona, Varsity Termite and Pest Control has over 20 years of experience dealing with pests from ants to cockroaches, termites, and even rats. Whenever you have a question, don’t hesitate to give us a call. We have licensed technicians trained in the latest and very best service methods ready to answer everything you want, guaranteeing satisfaction to our customers. We are built on awesome referrals from people that know we provide the most honest and reliable pest control service in Chandler! Bed Bugs: Do I Need to Worry about Them in Arizona? Read the rest of Bed Bugs: Do I Need to Worry about Them in Arizona?